Brightly painted wood Kiddush Cup designed by Yair Emanuel will add a splash of color to your Shabbat or Holiday table. 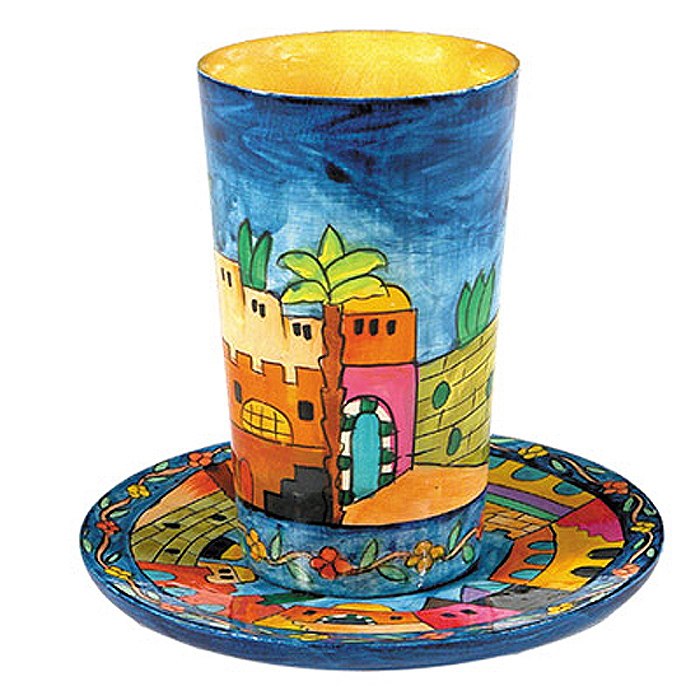 This colorful Kiddush Cup has a handpainted design of the buildings and sites of Jerusalem. For Passover, a matching seder plate, matzah tray, matzah cover, Elijah cup and Afikomen bag are available for purchase separately. Laminated for safe use. Hand-wash after use. This goblet holds a shiur [correct halachic amount] of wine for Kiddush. Perfect as a Judaica gift for any ocasion.